Just seven injections of vaccines or the aluminum salt added to vaccines caused alarming behavioral changes linked to a fatal nervous system disorder in sheep, a new study from Spanish veterinary researchers shows. Vaccinated lambs and lambs that received injections of aluminum that is used in human vaccines as well, began aggressively biting the wool from other sheep, pacing restlessly and overeating, according to the study published this week in the journal Pharmacological Research. Researchers from the Universities of Zaragoza and Navarra, Spain separated 21 male lambs into three groups. These received either common sheep vaccines, an aluminum ingredient called Alhydrogel used in many human as well as animal vaccines, or saline placebo. All other conditions were controlled. The researchers noted that the vaccinated and Alhydrogel animals became more solitary and anti-social than those injected with placebo. “In general, sheep are gregarious, and have a strong drive to be in the company of flock mates,” they said. Antisocial behavior is “uncommon and readily detected by an observer.” Fewer interactions with other animals “might indicate a deleterious effect on animal welfare,” the vets explained. As well as interacting less with their flock, the vaccinated and aluminum- treated animals were notably more aggressive than untreated animals and began to bite wool off of their pen mates. Wool-biting is a well-documented, serious and relatively common abnormal behavior in sheep that causes significant harm to both the injured animals, and potentially the animal ingesting wool, but there is no accepted explanation for it in the veterinary literature. Within months of their first seven injections, five of seven vaccinated lambs had multiple areas of wool loss on their rumps and withers as a result of wool-biting. Sheep exhibit a consistent and synchronous pattern of activity and resting, which the inoculations appeared to have altered. The lambs in the vaccinated and aluminum groups were more inclined to restless pacing and random repetitive behaviors compared to controls as well. These “stereotypies” can be indicators of animal stress or of damage to the central nervous system. “They also exhibited a significant increase in excitatory behavior and compulsive eating,” the study, led by Lluís Luján, a professor of veterinary pathology at the University of Zaragoza, concluded. In general, the researchers reported, the uncommon behavior changes were more pronounced in the lambs that received the vaccines rather than those given the aluminum vaccine ingredient only, though both groups were clearly affected while the control group was not. Some changes were readily apparent in the animals at their first assessment in summer, when they had received only seven injections. Overall, the animals received an accelerated schedule of 16 vaccines over 12 months to study the effects. Blood tests showed that cortisol levels in the vaccinated and aluminum treated sheep were elevated during winter when cortisol levels fell in control sheep. “Cortisol is a good indicator of stress in animals that are exposed to adverse situations,” the researchers noted. As well, white blood counts (WBC) of the vaccinated animals were significantly higher than those of both other groups -another indicator of stress. “In our study, conditions were not stressful, which suggests that the vaccination was responsible for the increase in the WBC in the Vaccine Group. The researchers published a separate study on October 31, in the journal Autoimmunity Reviews, which looked at tissue samples of the sheep post mortem following the experiment. 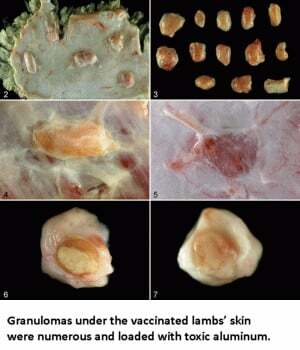 Microscopic examination revealed that the vaccinated and aluminum treated animals had numerous “granulomas” – lumpy, cheese-like nodules up to two cm in diameter under their skin and in lymph nodes far from the injection sites. These nodules were found to contain macrophages – a type of white blood cell that engulfs pathogens, loaded with tiny shards of the toxic metal aluminum. The jagged edges of the aluminum had pierced sacs inside some of the macrophages, spilling out and apparently, triggering programmed cell death responses in the surrounding tissue. Granulomas, the researchers noted, were more lumpy and prevalent in the vaccinated animals and tended to be flatter in the aluminum-only treated animals. None of the placebo animals had these bodies under their skin. Post mortem exams revealed the animals’ nervous tissue was riddled with the toxic metal aluminum. The experiment was part of a research effort to understand a mysterious new disease that had decimated the Spanish sheep industry between 2008 and 2010 following a government-mandated bluetongue vaccine campaign. Prof. Luján was approached by farmers at the time who were losing entire flocks to the disease. Animals were affected in two phases: in the first acute phase, only a few animals in a flock became nearly unresponsive with an acute meningoencephalitis, and a second chronic phase, sometimes months later and frequently triggered by an exposure to cold weather, affected up to 100 percent of flocks. The sheep became restless and anxious, then showed extreme weight loss and neurological damage. Eventually, all four limbs were paralyzed and they dropped to their front quarters, comatose, and died. The disease was reproduced experimentally by repetitive vaccination of sheep. Post mortem exams revealed the animals’ nervous tissue was riddled with the toxic metal aluminum. 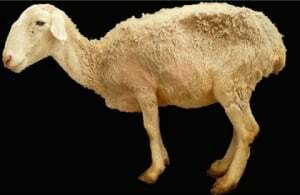 Ovine ASIA, as Luján’s team called it, is an animal version of Autoimmune/Inflammatory Syndrome Induced by Adjuvants (ASIA)– an immune system disease first clearly defined in humans in 2011. Immunologists, including leading Israeli immunologist Yehuda Shoenfeld, recognized that adjuvants – foreign substances in the human body including vaccine adjuvants designed to evoke a powerful immune response – can in some individuals hyper-stimulate the immune system into self-attack mode. Autoimmune diseases that are an expression of self attack can manifest as everything from atopic dermatitis and arthritis to severe nervous system disorders including Guillain Barre Syndrome and multiple sclerosis. These diseases now affect up to one in five Americans and are a growing global health concern. Many of these conditions have repeatedly been linked in medical literature to vaccination. Public health agencies have been aware of problems with aluminum adjuvants since at least 2002 when a public health symposium overseen by Mayo Clinic vaccine researcher Gregory Poland, heard French doctors describe a new disease, Macrophagic Myofasciitis (MMF) which developed after intramuscular injection with vaccines containing aluminum. Patients presented with extreme muscle fatigue and cognitive impairment and one fifth of them developed overt autoimmune diseases. Biopsies of their deltoid tissue revealed granulomas of aluminum in macrophages, much like those found recently in the Spanish sheep. More recent studies from the French and English researchers studying MMF revealed that in mice, injected aluminum migrates to lymph nodes – as was seen in the Spanish sheep – and to distant sites including brain where it persists for up to a year, activating the immune system in a persistent inflammatory state. In 2015, more than 75 immunologists and medical doctors and researchers collaborated on a medical textbook, Vaccines and Autoimmunity, which overviews the research strongly suggesting that vaccine ingredients can induce autoimmune diseases. They focused on aluminum, with more than 1,100 papers documenting its neurotoxicity. Aluminum strongly provokes the immune system and sets off poorly understood chains of immune reaction. It is added to numerous human vaccines including those for hepatitis A, hepatitis B, diptheria-tetanus, meningitis and HPV. Prominent defenders of injecting aluminum in children include Children’s Hospital of Philadelphia pediatrician and vaccine promoter Paul Offit who tells parents that the neurotoxic metal is not injected in sufficient quantities to cause harm. Health agencies have largely ignored the issue and vaccine manufacturers have proceeded as usual. The Gardasil 9 vaccine introduced in 2015, for example has twice the level of aluminum of its predecessor. Yet anxiety and compulsive disorders like those seen in the Spanish sheep – and like autoimmune diseases—have increased in children dramatically in recent years without satisfactory explanation. A 2017 Yale/Pennsylvania State University study reported, for example, that pediatric patients diagnosed with neuropsychiatric disorders like obsessive-compulsive disorder and anorexia nervosa were more likely to have received vaccinations three months prior to their diagnoses. Using health insurance claims data, pediatrics professor James Leckman and four other researchers found that significantly higher numbers of vaccinated children were found among those who were diagnosed with anorexia, OCD, anxiety disorder and ADHD as soon as three months after their vaccinations compared to controls. The anxious, repetitive and aggressive behaviour documented in this latest study of sheep experimentally may provide clues to the pathogenesis of neurological psychiatric disorders. And imagine, as clearly public health and oversight agencies have not, that similar pathological mechanisms may be occurring in vaccinated children. 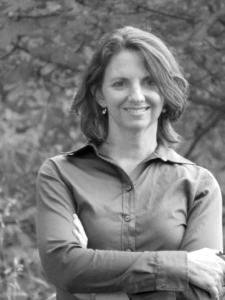 About the Author: Celeste McGovern earned her Bachelor of Science degree in Biology from the University of Ottawa and completed an internship at the National Journalism Center in Washington D.C. She was a reporter and columnist for The Report weekly news magazines in Canada for more than a decade covering a broad gamut of local, national and international issues. Her regular column for the magazine, “Brave New World,” looked at science and technological developments and their impact on culture. As a Special Correspondent for Reader’s Digest, Celeste reported on medical news and Canada’s judicial system. She received an in-house award from the magazine and First Place award from the Canadian Periodical Writers’ Association in the category of Investigative Journalism for her reporting on the parole system.